Beauty in the nineties was not to be missed: frosty pink lips, blue nails, glitter eye shadow, hair wraps, and more beauty blunders than one generation could handle. While we were stocking up on Kissing Koolers, mousse, and scrunchies, the real question is: Where did we keep all of our products? In our Caboodles, of course! 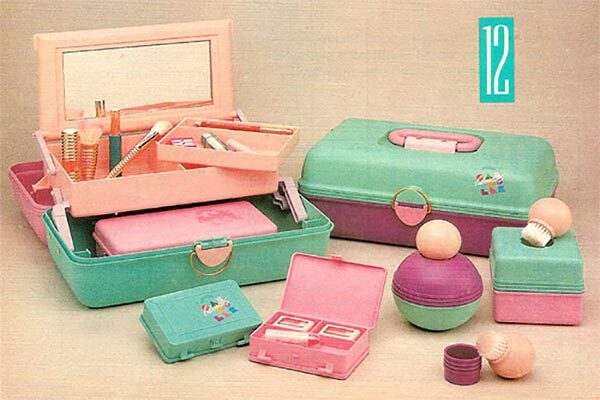 Every girl had to have one (sometimes two) to organize all of the necessities. If we were lucky enough, it was even personalized with our name in bright, puffy paint. Anya Hindmarch Patent Leather & Clear Plastic Travel Case ($250) has multiple compartments to separate all of your products. The clear plastic exterior also prevents your favorite lip gloss from falling into a deep dark hole. If you want a makeup bag that can double as a clutch, look no further than the 3.1 Phillip Lim 31 Minute Cosmetic Zip Case ($295). Henri Bendel Brown & White Stripe Beauty Train Case ($70) has an amazing vintage look that feels like you’re packing your products for an ocean-liner voyage, even if you’re really just taking the train home for the weekend. For travel, Mark and Graham Audrey Striped Cosmetic Case ($99) will be your best friend. It has plenty of compartments as well as a removable pouch for your most crucial items (Eight Hour Cream, anyone?). This company also offers complimentary monogramming, AKA puffy paint for grown-ups. However, if you take your traveling as seriously as your products, you may want to consider Rimowa Salsa Deluxe Beauty Case ($450). It’s totally indestructible and will basically let you bring your entire beauty arsenal everywhere.